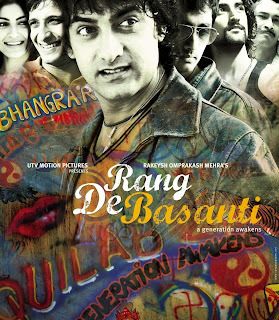 Rang De Basanti 2006 | FunToMovies 300 Movies '+g+"
A young idealistic English filmmaker, Sue, arrives in India to make a film on Indian revolutionaries Bhagat Singh, Chandrashekhar Azad and their contemporaries and their fight for freedom from the British Raj. Owing to a lack of funds, she recruits students from Delhi University to act in her docu-drama. She finds DJ, who graduated five years ago but still wants to be a part of the University because he doesn’t think there’s too much out there in the real world to look forward to. Karan, the son of Industrialist Rajnath Singhania, who shares an uncomfortable relationship with his father, but continues to live off him, albeit very grudgingly. Aslam, is a middle class Muslim boy, who lives in the by-lanes near Jama Masjid, poet, philosopher and guide to his friends. Sukhi, the group’s baby, innocent, vulnerable and with a weakness for only one thing – girls. Laxman Pandey, the fundamentalist in the group, the only one who still believes that politics can make the world a better place ….